Your most important tool when making portraits of children, and probably anyone else, is also one of the tools not available in stores. Fortunately it’s free, but not necessarily easy to aquire. It’s “patience”. I know far too many photographers that think that they can shoot 20 portraits an hour. That’s wrong. Very wrong. For several reasons. Reason number one is, that it takes time for the child to relax in the studio – relax so you can get those natural facial expressions that makes the difference in a portrait. I will write several advice later on how to help them relax. Reason number two is, that you need time to get to know how to interact with the child. Some children are very shy and uncertain on how to pose and react to your “commands”. Don’t rush it. Go slowly and listen and observe how they behave when you say something. Other children are “naturals” – photogenic from birth – and can pose the right way in the first shot. Don’t abuse this advantage to shorten the shoot. Use the advantage to take the shoot even further. Reason number three is, that you need time to find the right style and mood for this child. We’re all different and not all subjects look well in any kind of lighting, background and pose. Some are very suitable for happy high key portraits, others are better portrayed in an emotional low key setup. Don’t think that you can tell up front what suits the child best. Don’t think that the parents know either. You’re the expert in light and expressions. Try! Reason number four is, that you’re making a photo, that will probably be hanging on a wall in the family for a very long time. If you do your job the right way, it will hang there for decades. And in grandma’s house too. Do you know how many clients you’ll get just from looking at that striking emotional portrait? A lot! Believe me. Parents are proud of their children – of course – and they will show the portrait to everyone they know. Through the use of social media sites like Facebook and Google+ they will show the portrait to even more people (DON’T limit their ability to do this through obscure and ridiculous photo usage rights!!!). I get most of my clients from the free and effortless marketing done by previous clients. Don’t underestimate the impact of this. If you don’t believe me when I say that time and patience is of the greatest importance, I will just recommend that you try it one time. 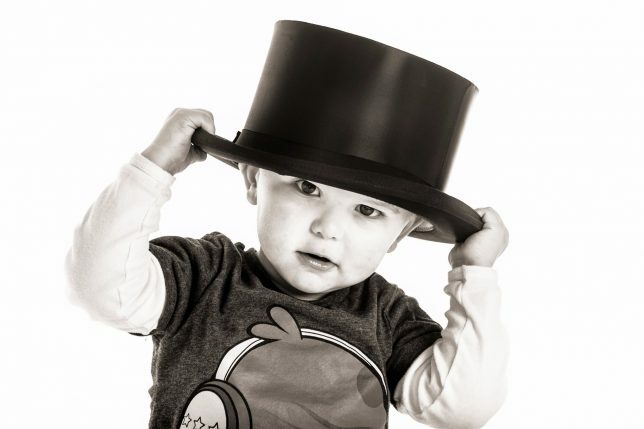 Have a 1½ hour photo shoot with a child. Then take a look at the first photos and compare them to the last ones. I’ll bet you’ll see a significant difference and improval.